Access All Areas members have a fantastic set of textures to download this week, courtesy of GhostlyPixels. These 10 vintage fabric textures cover a range of textiles from denim varieties to standard t-shirt material, they are all high quality full page images available in both vector EPS and transparent PNG formats. Use them to add some good old vintage flavour to your designs in Adobe Illustrator, Adobe Photoshop and most other design and image editing software. GhostlyPixels is the creative store of Joseph Smietanski, a designer who loves making hand illustrated goods and textures. His vast collection of products includes many sought after resources to help you create aged and distressed designs. If you fancy a taste of Joseph’s other items, all Spoon Graphics readers can download a selection of 5 free vintage textures in EPS & PNG format from his website. 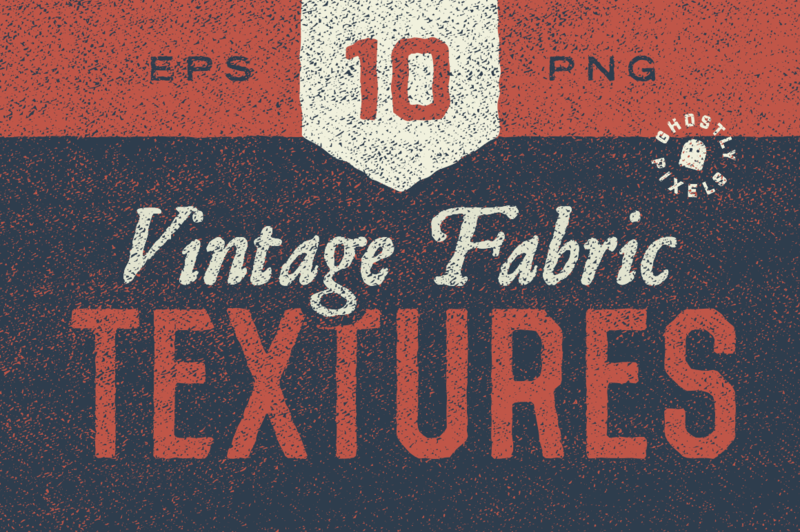 Access All Areas members can now download this complete set of 10 vintage fabric textures in EPS & PNG format as part of their membership. Each one is an isolated texture of various fabric materials, providing detailed images that can be used as backgrounds to your designs, or applied to masks to erode your artwork away for the antique look. Thank you Chris. Beautiful work as usual!